Seqwater has engaged Verterra to undertake a two-year planting maintenance program at Billies Bay Property sites. The Scope of Works includes: weed control; slashing; provisional planting (replacement of failed stock if required); reporting and provisional fencing install and maintenance. The total site is comprised of approximately 15 ha and is undulating in nature. Access is via leased land on unformed 4WD tracks. Since 2017, Verterra has had in-house UAV capability for delivery of environmental services. Our Matrice 600 Drone is equipped with high-resolution colour camera and multi-spectral camera enabling Normalised Difference Vegetation Index Mapping (NDVI). UAV services for this project include: NDVI as part of bio-condition monitoring. Seqwater’s expansion and upgrades to the Mt Crosby WTP sludge disposal area and East Bank Bulk Chemical Storage; and Samsonvale Postman’s Track trail network impacted on local koala habitat. Subsequently, Seqwater entered into an arrangement with the Regulator EMP to create three offsets at its Wivenhoe, Billies Bay Site. The offsets were established and are currently in a maintenance phase. 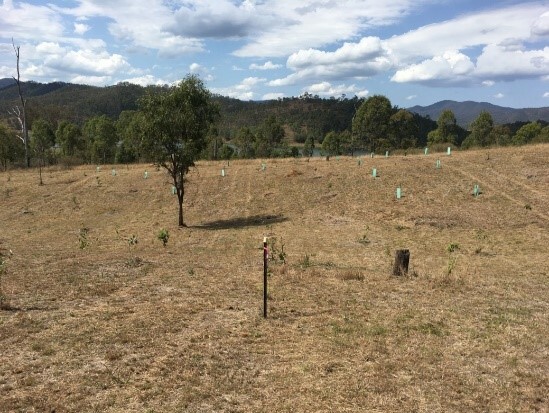 Seqwater’s key objective is to achieve offset delivery that complies with the regulator’s requirements for non-juvenile koala habitat trees that will progress to remnant status. Seqwater also has a critical interest in water quality maintenance by minimising environmental risks from hazardous substances and erosion. Specific challenges and risks associated with this project include but are not limited to: access and possible restrictions during periods of wet weather; managing sensitivities with respect to the tenant; avoiding environmental hard from hazardous substances entering local watercourses and the Dam. Verterra team brings extensive direct experience in natural systems management and includes the ability to successfully establish and then maintain plants in challenging environments; weed identification and management; weed control and landholder engagement. Successful delivery of the offset that complies with the Regulator’s requirements for non-juvenile koala habitat trees that are progressing towards remnant status.